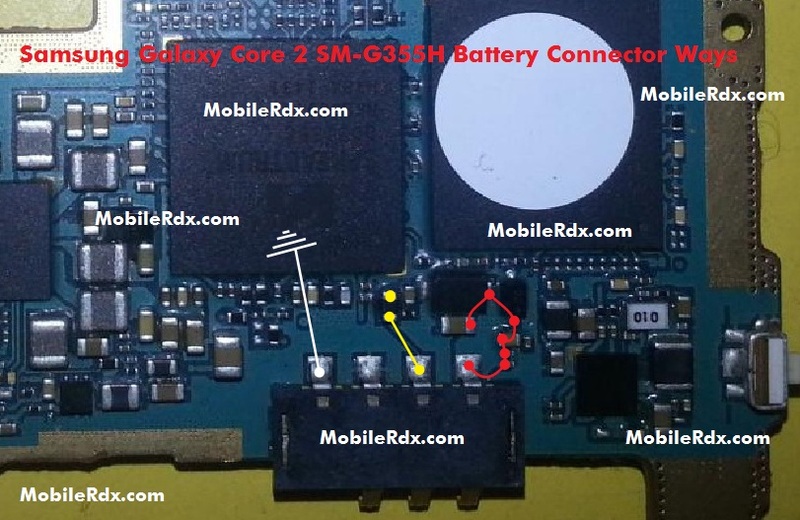 Samsung Galaxy Core 2 G355H Battery Connecter Point Ways Jumper Solution – This time we will try to discuss about the solution path on the Samsung G355H battery in this troubled afternoon -_- “. The damage to the battery lines often in the causes for the track is wet or disconnected without visible breakdown lane next to where : D. Or these tips could be to carry out checks on the mobile phone is the Samsung SM-G355H. Here are the simple steps to overcome damage to the battery or the phone lines Samsung Galaxy Core 2 G355H. Steps that must be done is to check the battery lines as shown below, check the path carefully one by one, do not forget to also check through the resistor in the line, if something is broken, disold or corrosion. There is a path-breaking try to make jumpers carefully and thoroughly. Damage or repair errors caused by existing solutions in this blog are not the responsibility MobileRdx.com, we just want a little help you in improving mobile phone.